For those of you who thought Evanescence was done making music, get ready to be taken aback. Gather all the most gothic three to five year old children you know, because the lead singer from Evanescence will be dropping a children's album. OK, OK, just kidding... sort of. The children don't necessarily need to be gothic. But they should be children, because in all sincerity, the band's front woman Amy Lee has made some music specifically for them. After taking a hiatus from music, Lee from Evanescence really is releasing a children's album, and the first song has already been released. It's called "Dream Too Much" and is in a lot of ways the direct opposite of 2003's hit, "Bring Me To Life." Go figure. The album — which drops September 30 — was apparently Inspired by her 2-year-old son, Jack Lion. It's a mix of both original songs and covers of kid classics. 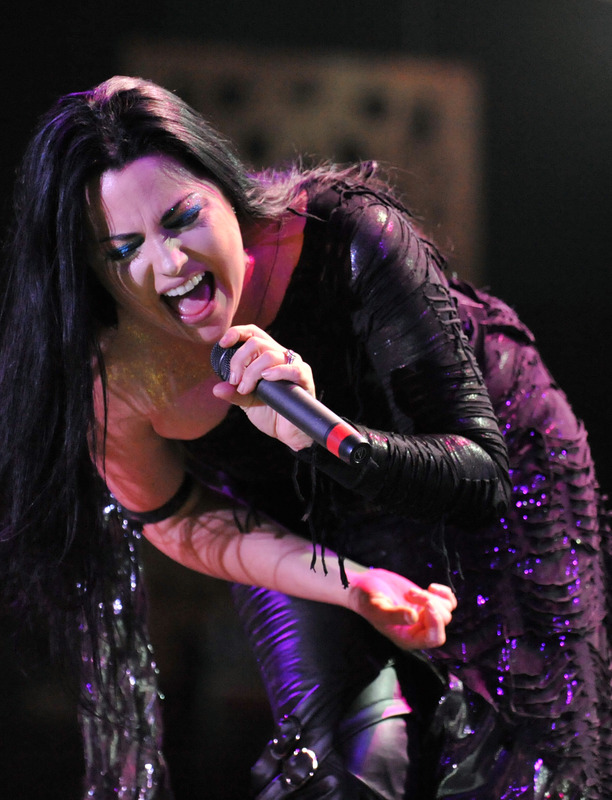 Which means that yes, Amy Lee could cover songs like "The Muffin Man" and "Skip To My Lou." Does it ruin your childhood to know that? Either way, I'm sure hearing this makes your 2004 self experience a whole slew of contradicting and confused thoughts. See what I mean? Here. I'll help you through this with some Evanescence lyrics that perfectly describe the way you're feeling right now. We're all in this together. 1. "Suppressed By All My Childish Tears"
Childish tears — but not fears — are definitely, actively being suppressed. 2. "Cause Your Presence Still Lingers Here"
Because I can't get it out of my head that you are Amy Lee, lead signer of Evanescence. You sing about death and pain?! 3. "There's Just Too Much That Time Cannot Erase"
Yeah, it's been years. But not long enough to forget the really, really depressing vibe of your music videos. 4. "All This Time I Can't Believe I Couldn't See/ Kept In The Dark But You Were There In Front of Me"
Or has this always been the final goal? Maybe I should have noticed it from the beginning. Were there signs? 5. "Call My Name And Save Me From The Dark"
Maybe...just maybe this is Amy Lee's way of doing that. 6. "Make Up Your Mind"
Are you an emo band from the aughts or are you a children's singer? 7. "Should I Let You Fall?/ Lose it All?" Should I let you fall down the rabbit hole of becoming said children's singer? 8. "So Maybe You Can Remember Yourself"
Perhaps that's how you will find your true self. 9. "There Must Be Something More"
10. "Just When I Thought I Reached the Bottom"
I've really thought about it, long and hard, and nope. This makes no sense. 11. "Somewhere Beyond the Pain/There Must Be a Way to Believe/We Can Break Through"
All you Lee and Evanescence fans, no need to worry. We can bury this and pretend it never happened. How's that sound? A lot more calming than "Dream Too Much." Right?